Are you interested in taking your beauty routine to the next level? If so, do I have the class for you! 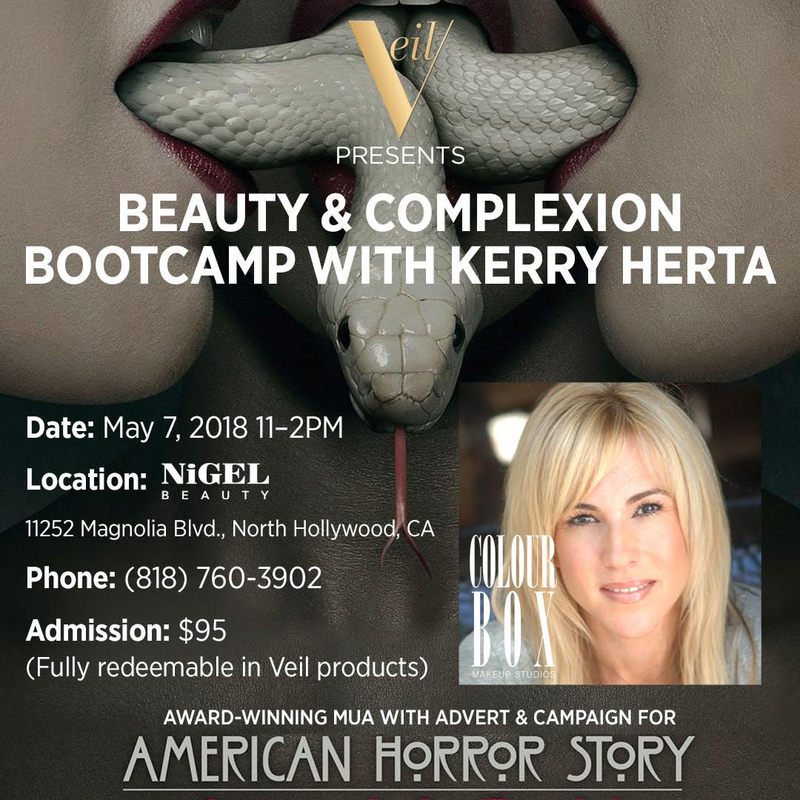 Kerry Herta, the incredible American Horror Story artist and award-winning makeup artist has partnered up with Veil Cosmetics to bring you a beauty and complexion bootcamp. The 3 hour class delves into the details of color theory and anatomy to help you identify skin types and undertones, how to best color match foundations with specific skin tones, and a lesson on facial anatomy to take your contouring and highlighting game to the next level. Once you have the groundwork started, Kerry will continue with makeup design and product breakdown to teach you profession tips, tricks, and methods to creating a flawless complexion; provide a "how-to" guide for the latest beauty makeup trends and techniques, provide tips on layering colour for long wear, and impart her knowledge about specific products and formulas. The Beauty and Complexion Bootcamp with Kerry Herta will be held Monday, May 7th from 11am to 2pm at Nigel Beauty Emporium in Los Angeles, California. Tickets can be purchased for this course for only $95 at Eventbrite here. Because the class is being sponsored by Veil Cosmetics, the admission price is fully redeemable in Veil products at Nigel Beauty within 14 days of the course. Now that's what I call having your cake and eating it too! If I lived in that area I’d be all over this! When I was working as a makeup artist I'd have gone nuts for this kind of class. Sounds like It would be a really neat thing to attend! That sounds so exciting and fun too! Thanks for the info on this event! This sounds like a great event, I wish I lived on that side of the country! She's really pretty!! Learning from her would be awesome.